School board members study information packets during their meeting Thursday, September 15, 2016 at the Hamilton County Department of Education. There was little consensus Thursday night as the Hamilton County Board of Education launched into discussion about the search for a new superintendent. It was the first regular voting session of the new board, which gained three new members this month, and the board's division on how to move forward quickly became apparent during discussion. Five board members said they were ready to discuss the superintendent search firms the board interviewed Tuesday night and vote on one to help the board find a new leader for the school system. But the three newly elected board members — Tiffanie Robinson, Kathy Lennon and Joe Wingate — each said they wanted more time before making a decision. 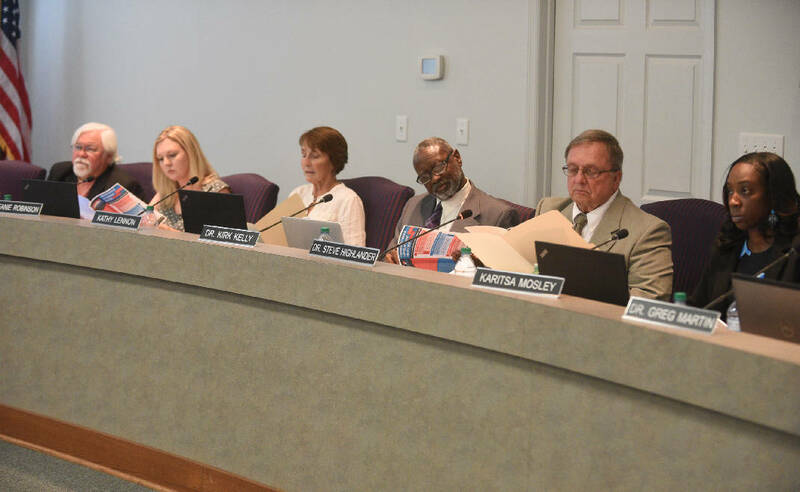 School board member Karitsa Mosley Jones agreed, and though Chairman Steve Highlander said he was ready to select a firm, he cast the fifth vote deciding to postpone selecting a search firm. Before making the decision, Robinson said the board needs to come together as a team and develop a strategic plan, which hasn't been done in years. "Whether we choose the right search firm, we need to make sure we have the right roadmap for them to follow so they can do the work quickly," she said. Board member Rhonda Thurman argued the board has had proposals from the firms for months, and it's time to stop delaying the search and get moving. She and school board member David Testerman agreed that a strategic vision could be developed after selecting a firm. School board member Joe Galloway argued each of the firms' presentations sounded the same, so he thought the board should just select the cheapest option: the Tennessee School Board Association. Wingate quickly jumped in, arguing the two more expensive firms are not at all like the TSBA. He said the other two firms work on a more national scale. He also proposed starting the whole process over from the beginning, voicing a lack of satisfaction with the firms that were interviewed. Thurman said any of the firms interviewed will follow the direction the board gives them. "I just hate to keep pushing this back and pushing this back," Thurman said. "I know what I'm looking for in a superintendent, and I'll tell any of the firms what I'm looking for and I think they can probably go find whatever." Mosley Jones asked why there is a rush to start the search. "We have a team in place that is working, that is working seamlessly since they started," she said. The previous board named Kirk Kelly interim superintendent in April after Rick Smith's resignation in March. In attempts to rein in the conversation, Highlander suggested the board meet at another time and develop a strategic vision. "We do need to work as a unit and not separate," Highlander said. The nine-member board voted unanimously at the end of the meeting to continue the conversation in the near future, likely with the help of an external facilitator. At the beginning of the meeting, before the conversation, Jonas Barriere, executive director of UnifiEd, urged the board to make the search for a superintendent transparent and inclusive of the community. He asked the board to pass a resolution guaranteeing it would implement four strategies throughout the search process. He asked for: public access to candidate resumes, a live stream public interview of the candidates, a forum where community members can engage with the finalists and the creation of a community advisory council. Kalena Rodriguez, a student at STEM School Chattanooga, also addressed the board and asked for community involvement in the search. "We need a leader, someone to be the voice for all of us," she said.